Extremely beautiful and captivating with its snow-white façade, the Lupciansky castle in Slovakia is a typical example of a medieval fort in this part of Europe. Diligently maintained today Lupciansky castle is one of the most attractive tourist attractions in this part of the country. Behind the palace lies nearly 8 centuries of history. Built in 13th century Lupciansky is still inhabited today. It stands prominently on a hill above the title Slovakian village which is located very close to Banska Bystrica. Lupciansky castle dominates the valley Hron. Locally it is known as Lupciansky Hrad. The palace was built on a mountain ridge 410 meters above sea level. Medieval fortress Lupciansky was erected shortly after the invasion of Tatar tribes in these lands in 1241. 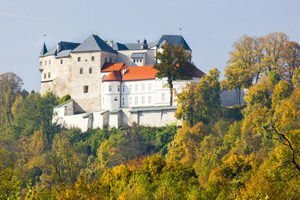 At that time, Slovakia was part of the Hungarian Empire and its head is the one who ordered the erection of the palace, where he subsequently settled. The rise of the medieval fortress Lupciansky yet was no accident in this place. Castle had the task to guard and keep the old, but still an important route between Zvolen to Brezno. Quite often the castle was visited by King Belo IV. The medieval castle remains in the possession of the management of king Ondrej III. After his death the property fell into the hands of Demeter and Donc, which are in fact ancestors of a noble family, Balasa. In 1306 the castle Lupciansky was conquered by Mathias Csaky, who long has liked the imposing structure of the palace. Eight years later, the fortress was returned to Donc. The tradition of Hungarian kings arriving to visit the Lupciansky castle continued during the 14 century. Heads of state arrived usually during the summer months. Meanwhile Lupciansky Enlightenment was also a place where were written many important scrolls. One record that in 1424 King Sigmund of Luxembourg shall transmit Lupciansky entirely to his wife. In the second half of the 19 th century Lupciansky castle was burned, which requires its complete restoration. After this lengthy repair of the palace in Neo-Gothic style. In the late 20th century was built a small museum across the snow-white walls of the castle.